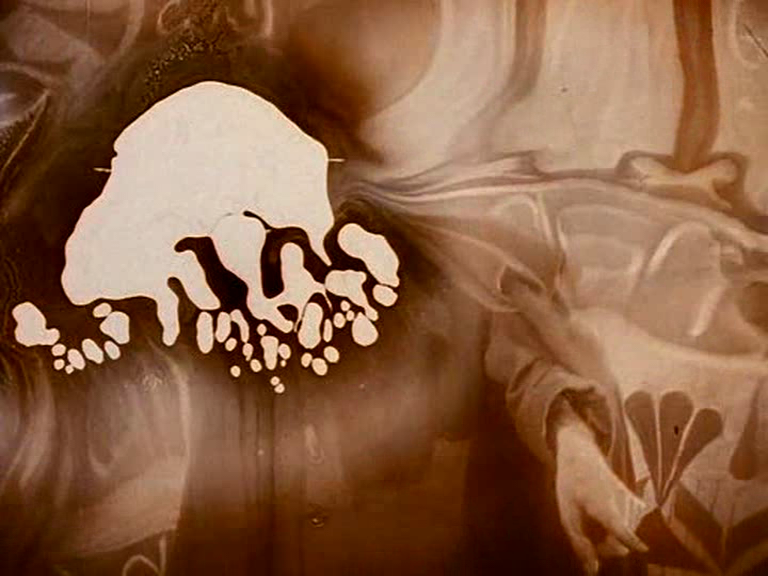 Nitrate decomposition, as seen in Bill Morrison’s beautiful THE MESMERIST, which is composed of clips, in various stages of decay, from THE BELLS, starring Lionel Barrymore and Boris Karloff. 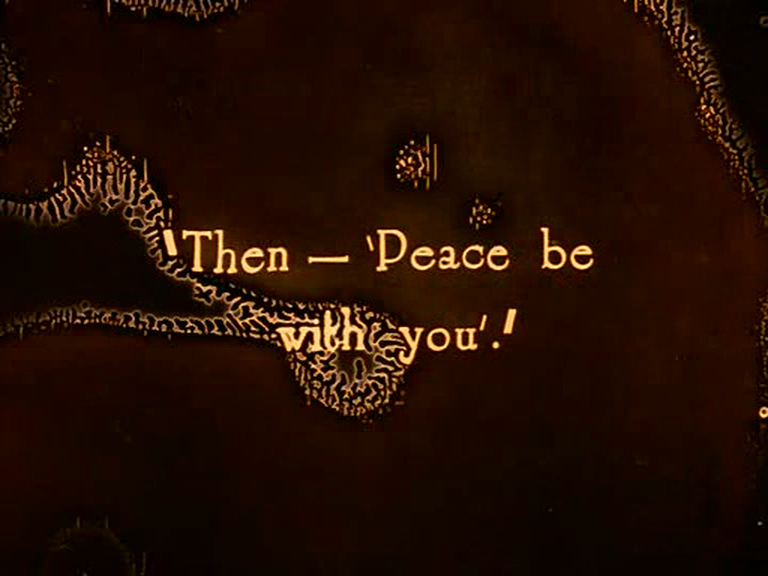 Here, it looks like the intertitle has been printed on a microscope slide, as if the text were a paramecium’s speech bubble. Nitrate decomposition is much on my mind, as we’re attempting to simulate it in my documentary, partly as a transitional device — we can have one shot melt into another — partly to blend together different kinds of footage (35mm from the teens, twenties, thirties and forties, digital video from the twenty-first century) — partly, if necessary, to censor some footage — so we have to look closely at what the footage is made of, in order to reconstruct it. This particular film uses big white Rorschachian bubble-clusters quite a lot. When frozen, they sometimes have a crustacean shape to them, and their whiteness is that of the white whale, the colour of nature when everything else is stripped away. Then there’s also the Jack Kirby anti-matter black frogspawn, which is pretty rare but always scary and exciting when it comes crawling into the frame, clustering on the actor’s faces as if to consume them like the neg-scratch monsters in THE FLESH EATERS. Some of this is a product of the decalcomania effect, Max Ernst’s name for what you get when you apply thick paint to a surface, squash it under another surface, then peel the two apart. The same thing happens to celluloid when the film loses its stability and the image turns to jam, squished together in a reel of film. Unreel the film and all these abstract patterns are created as the film peels away from itself. The buckling and warping of the print causes mobile blurring of focus, since the film will wibble-wobble on its way through the projector, the distance between lamp and image changing irregularly. And then there’s the squash and stretch on the image itself, as it gets distorted, fun-house mirror fashion, by the shrinking and expansion of the film strip. We’re less interested in fake scratches, which you see all the time in phony reconstructions, but we may deploy some awkward hot-splice jump cuts, with accompanying (but just out-of-synch) soundtrack glitches. Nothing so beautiful happens when digital information decays, and in fact you very quickly get something that can’t be viewed at all. So it’s arguable that film is superior to digital, even when it goes wrong. This entry was posted on November 11, 2012 at 1:03 pm and is filed under FILM, Painting with tags Bernard Natan, Bill Morrison, Boris Karloff, Lionel Barrymore, Max Ernst, The Bells, The Mesmerist. You can follow any responses to this entry through the RSS 2.0 feed. You can leave a response, or trackback from your own site. I’ve read a bit on poor splicing techniques which didn’t happen just at the theaters because of breaks, but also at the exchanges when the reels were repaired. It amazed me that training just wasn’t thought of until the mid-’20s. But even a good splice, when it goes through the projector, will probably be visible and certainly audible if there’s sound. Raging Bull has splices between the colour sections and the b&w, because Scorsese wanted to print those on real b&w film. So they purposely faded the sound out every time they make the transition. Spielberg didn’t think of that on Schindler’s List, and so you got these audio farts every time the girl in the red Don’t Look Now coat showed up. Certainly audible! I remember the clunks and pops at every splice when my class was watching 16mm films way back in elementary school. Going to revival houses was reminiscent of that, it was rare they got a fresh print. A patch was manufactured to fade sound at splice points back in the ’20s, but I have a feeling it was not much used. I wonder if Spielberg knew about it. At any rate, it didn’t work for him. How did you view this? I am frantically trying to find a copy or an online version. Might not play on your DVD player if you’re not in the UK, but you can watch it on your computer.